These are one of my all time favorite cookies. 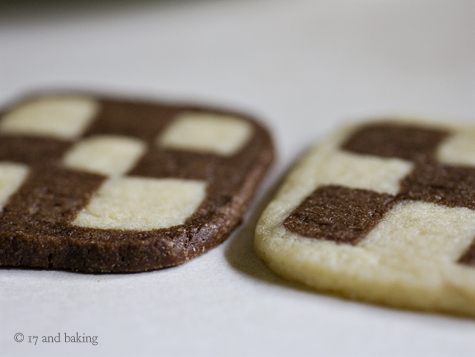 The dough is so simple to make, and the checkerboard pattern, though it does take a bit of practice, isn’t too hard. Once you’ve got the logs, the cookies are a snap to slice and bake. The result is incredibly impressive. People gasp when I open the cookie tin for them. The cookies are more than a pretty face, though. Sometimes when I’m feeling lazy I just cut the dough into squares and bake them. 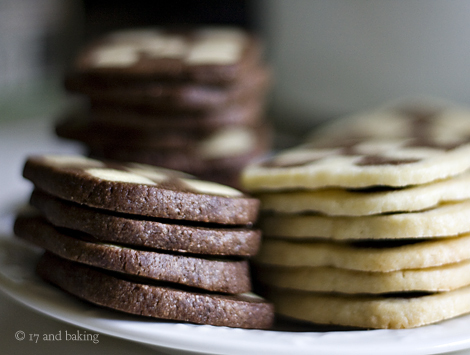 You can slice them thicker, for a slightly softer cookie with crunchy borders, or slice them thin for crispier cookies. I’m normally a chewy cookie person, but I love these thin too. It’s also worth mentioning that I LOVE this cookie dough! I almost, almost like it more than the baked cookie. This recipe makes a lot of cookies – 8 dozen, because it’s easier to work with a large amount of dough – and yet I still sometimes snack on too much dough. It’s always hard for me to save up enough dough to wrap around the checkerboard pattern for the solid border. If you think you won’t be able to work with 8 dozen cookies, don’t worry, you will. If you can’t eat them all, you can also freeze the logs and thaw them in the fridge overnight prior to slicing and baking. It’s a little tricky to explain how to make. If you check out the original recipe on Baking Obsession, Vera kindly draws a diagram to explain the process. Sift together the flour, baking powder, and salt. Set aside. Cream the butter and sugar together in the bowl of an electric mixer until light and fluffy. Add the eggs one at a time, and then the vanilla extract. Add the flour mixture and mix on low speed to just combine (you might want to cover the mixer with a towel, some flour might come up.) Finish the mixing either with your hands or a wooden spoon, being sure not to overmix. Take one portion of chocolate and one portion of vanilla out of the fridge. Let sit at room temperature for 15 minutes to soften. On parchment paper or a lightly floured surface, with a floured rolling pin, roll out the vanilla dough into a 12″ by 5″ rectangle. Using a pizza wheel, knife, or bench scraper, cut the rectangle into nine strips, each 1/2″ thick. Repeat the process with the chocolate dough. 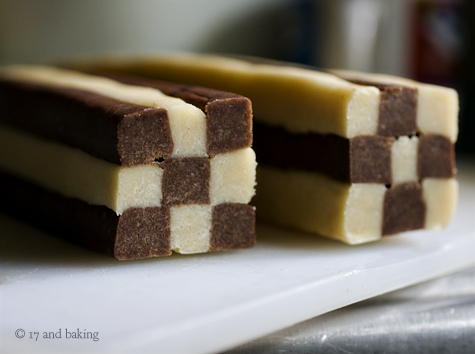 Form two checkerboard logs: delicately alternate chocolate and vanilla strips to form a three by three square. One log should go: vanilla chocolate vanilla, chocolate vanilla chocolate, vanilla chocolate vanilla. The other log should be chocolate vanilla chocolate, vanilla chocolate vanilla, chocolate vanilla chocolate. Press into the sides to make it as even a square as possible. Wrap with parchment paper or plastic wrap and chill for 2 hours. Afterwards, roll the remaining vanilla portion into a rectangle of 12″ by 6″, about 1/3″ thick. Take the log with 4 strips of vanilla and wrap the dough around it to form an even border. Roll the log to press it in and define the corners. Repeat with the chocolate dough and the remaining log. Wrap the logs in parchment or plastic and refrigerate well, preferably overnight. You can also freeze them, then thaw overnight in the fridge when ready to bake. When you’re ready to bake, preheat the oven to 350F. Cover a large baking sheet with parchment or a silicone mat. Using a very sharp knife, slice the cookie-dough log into ¼-inch thick slices. Place on the prepared baking sheet leaving about 1 inch all way around them. Bake the cookies, in batches, for about 12 minutes until firm and golden brown on the bottom. 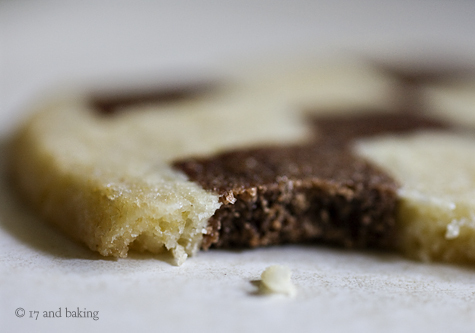 Don’t let them bake for too long, or the color contrast between the chocolate and vanilla dough will be lost. Cool on the baking sheet on a rack for 15 minutes. Then transfer the cookies to the rack and cool completely. Entry filed under: Cookies. Tags: buttery, chocolate, Christmas cookies, Cookies, crunchy, vanilla. these are so cute and congrats! boston is one of my favorite cities and you’ll be a kick but journalist! Congratulations on the college acceptance in Boston, that’s so exciting! And those cookies are oh-so pretty! I’m basically in love with them :) But I’m sure if I tried to make them they wouldn’t turn out near as good. I love your blog so much and in fact I was so inspired by yours that I decided to try it out for myself. This recipe looks spectacular. Keep up the inspiring work! Congratulations on graduating! I hope it cleared up in time for the ceremony. I just stumbled across your blog, looking for a recipe for a cake I could take to Yosemite for my dad’s birthday that would be better a couple days after baking. As I read down your post I was stunned to see that you were a teenager. Not to be ageist, but I have lived quite a bit longer than you, and your writing voice – and baking knowledge – display so much wisdom. I am so moved by your writing, your passion for baking, and what you write about your family. I also have (had, she sadly passed) a Chinese mom and a dad who once baked (these checkerboard cookies were ones we did at Christmas from Dr. Oetker’s cookbook). I now have a 3 year old and I hope he will turn out like you – someone who grows up amidst much love and warmth in the kitchen and someone with talent and passion. I am really, really impressed and inspired by you. Best of luck with your move East. Looks like you may be going to Emerson! I’m an alum of that school, and can say that the best part of my education there were the extra curricular activities. Make sure you stay involved! If Emerson is where you’re headed, you’re definitely going to have a great time. I know what you mean about the weather. A Seattleite myself, it can be frustrating to endure these weeks of June this year that are as dreary and dark as a fall day. Where’s the sun!?!? 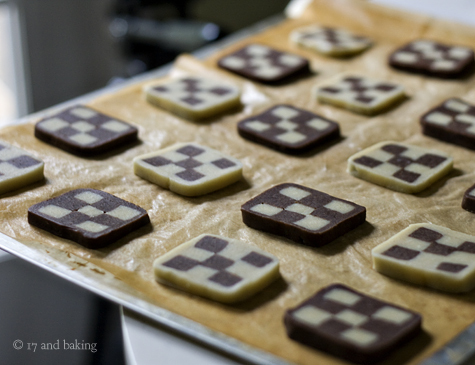 Those checkerboard cookies look perfect, just as professional and neat as the ones at Ballard’s Cafe Besalu–one of the best bakeries in the city! Evocative and beautiful post, with cookie to match! Gorgeous!! If I wanted to use ginger instead of cocoa how much ginger should I use? Is there anything else I could use instead of cocoa, i’m not a big fan of chocolate. Thanks! Oh man I’ve been reading your blog all day whilst bored at work (yes, when everyone else is off cause of July 4th!) and been commenting like a maniac and realize you’re coming here! P.S. 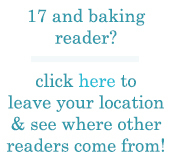 If you ever need to know where to find a certain ingredient, baked good, etc. feel free to e-mail me any time! these are lovely. i have made something like this in the past, but mine never looked like yours. thank you! These cookies look so yummy, will have to try them sometime. I made these two nights ago to bring to my coworkers. They did not turn out as pretty as yours, but they were delicious! I had a lot of trouble with the dough not rolling out correctly and slicing the logs – the different layers would not stick together and kept crumbling. Did you ever experience this? Any thoughts on what I could have done wrong? Geneviève – I had the same trouble just last night. The mix was REALLY dry. I had to add another half stick of butter just to pretend to get through it. I refrigerated it for 4 hours and could not get it to come back to a normal consistency. I may try warming it later but I think my batch is entirely dead. Your writing is, as usual, spectacular. Its amazing that you’re only one year older than me, yet you’re so talented both in the kitchen and in writing/journalism! By the way, this is probably my favorite post ever. Its so beautifully written and describes a perfect weekend for me. I love how you make the little things in life sound so wonderful and it just gives me a warm and glowing feeling inside. Thanks again! I was surprised to see how much this blog entry relates to my own life right now. I became interseted in your blog because i too share a passion for baking. I am a senior in High School and graduation is fast approaching. I am planning to attend the Art Institute of Houston in order to continue my dreams of becoming a chef and eventually owning a cafe. Your passion for baking at such and early age is remarkable! I feel the same and love the fact that baking is something I will always have and that no one can take away from me. It’s how I express myself, how I make mistakes and how I improve. Thank you for sharing with us the joy that baking brings to your life, it has and will inspire many of us. 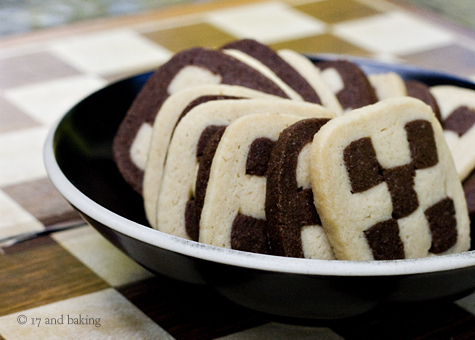 OMG those checkerboard cookies look so delicious. These cookies look so fancy, and they were so easy to make! I tried out this recipe today but ignored the parts about waiting hours for the dough to chill in the fridge – I was just too excited about eating the cookies to wait! I will make them one day. With strawberry instead of chocolate. Oh my god, that would be so pretty but so Asian of me because Pocky. I tried them and they did not work out to well but they tasted good. I’ve got lots of information on space development of Russians. Who needs it? Who needs the access to closed government data? I perform complex and dangerous (secret) work on the territory of Russia. this and understand this side of ykur story. I can’t believe you’re not more popular since you most certainly have thhe gift. Thank you for the good writeup. It in fact was a amusemeht account it.